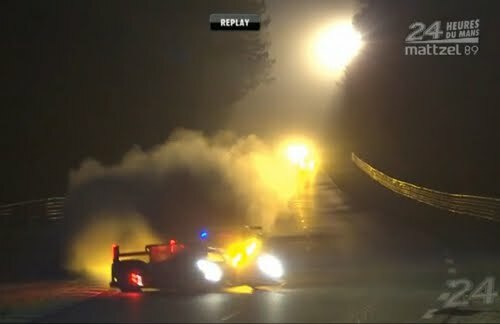 Nearly seven hours after Allan McNish's horrific wreck, Audi suffered another devastating blow today at Le Mans in an eerily similar accident, this time involving Mike Rockenfeller's #1 R18 TDI. Like McNish's crash, Rockenfeller was attempting to overtake a slower, GTE-class Ferrari, which caught the Audi's left rear between Mulsanne and Indianapolis. This contact sent Rocky's R18 abruptly into the barrier, demolishing the car. Like McNish, Rockenfeller was thankfully able to exit the demolished R18 TDI on his own, citing little more than a small cut on his arm. Again, an amazing display of the safety measures employed by Audi's designers and engineers. Happy that Rocky is uninjured, we're now pulling together to root the #2 R18 TDI driven by Marcel Fässler, Andre Lotterer and Benoît Tréluyer on to victory at the 2011 24 Hours of Le Mans!